The earth has two magnetic poles which are close but not coincident with the North and South pole. Rocks which form under their influence may orient themselves if they contain magnetic elements. Curie Temperature - 580°C - above this temperature thermal motion is high enough to keep all iron atoms in random motion and there can be no orientation. As a magma cools it is first well above the Currie Point and hence randomizes all of the iron in a mineral. As it continues to cool it passes through the Currie Point and will be affected by the earths magnetic field. So as long as it exits and is not reheated to above 580°C or destroyed by weathering, it will retain this internal compass. The uplift happening during sea floor spreading brings new material up to form the ocean crust. During the time it cools and spreads out over the ocean basin it takes on the magnetic alignment of the poles. 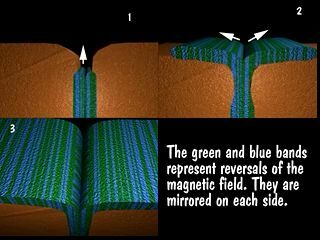 Through out the last 20 million years we have a record of many magnetic reversals of the poles. They have been dubbed magnetic chrons. On each side of the ocean center line is a record of the reversals and they mirror one another.